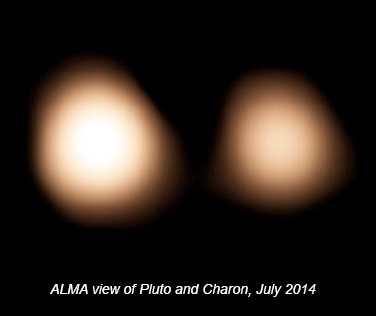 Combining Data: Scientists are using new and archival data to pinpoint Pluto’s position. Read how the New Horizons team is reanalyzing visible-light measurements stretching back to Pluto's discovery, and combined that information with measurements from the Atacama Large Millimeter/submillimeter Array (ALMA) to target the New Horizons spacecraft for next summer’s close encounter at Pluto. Marc Buie, a New Horizons co-investigator from the Southwest Research Institute, has a deep and long-term interest in Pluto and has created the best maps to date of Pluto’s surface by using data from the Hubble Space Telescope. 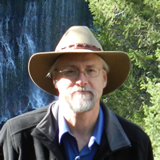 He is on the New Horizons search team for a potential extended-mission flyby target as well as the pre-encounter hazard search team; his support work also includes ephemeris improvements for Pluto and its satellites. New Horizons has traveled (nearly) nine long years to get across the solar system to check out Pluto – and it’s actually harder than you might think to make sure that Pluto will be there to greet us at the end of our journey. Sure, we've been studying Pluto since 1930 – but that's only a third of Pluto “year.” To get all the great data we've been planning for, we really want to make sure we know where Pluto is. What's so hard? Well, we can measure Pluto's position in the sky pretty easily. But it’s much harder to figure out exactly how far away it is. We could observe it for a couple of Pluto years – about 500 Earth years – but that would take too long. To tackle this problem I dug into the archives at Lowell Observatory in Arizona, where Pluto was discovered. Astronomer Carl Lampland started taking pictures of Pluto right after its discovery in 1930, and helped with the early work to pin down Pluto's orbit. He continued this work for 21 years until his death and left behind an untapped legacy of work. By combining his old images with high-quality modern star catalogs, we can go back in time and get better positions of Pluto dating back to 1930. Working with Jonathan Grindlay and his team at the Harvard-Smithsonian Center for Astrophysics and William Folkner at NASA’s Jet Propulsion Laboratory, we have been able to get new (old) positions of Pluto and use them to significantly improve on where we think Pluto is. With this improvement, the team driving New Horizons can tweak its flight to get to the right place at the right time. At this point we think we know where Pluto is to within about 1,000 kilometers, or about 620 miles. Considering that Pluto is about 4.5 billion kilometers from Earth, that's doing pretty well indeed, good enough for all the plans we've developed for looking at Pluto when New Horizons arrives in July 2015.